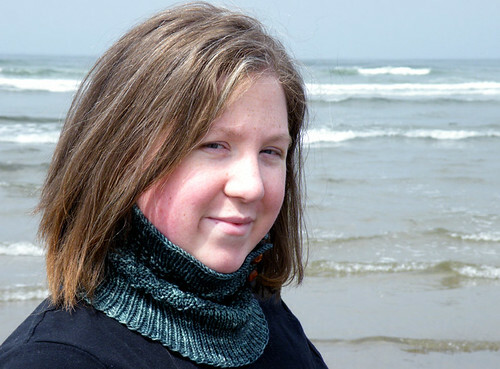 If you want the warmth of a scarf but, like me, the idea of knitting a scarf makes you want to curl into the fetal position at the thought of how boring it is to knit a scarf, then the cowl is the project for you. 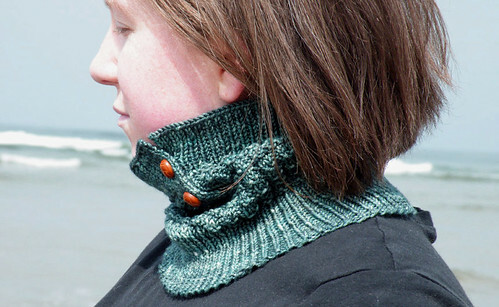 Once cooler weather rolls around, I will be getting a lot of use out of my Thermis cowl. And probably making several more. This was knit out of MamaBlue Troika sport in Algae, using size 4 and 2.5 needles. This was my first time knitting with MamaBlue! Once again, these pictures were taken at Cannon Beach. 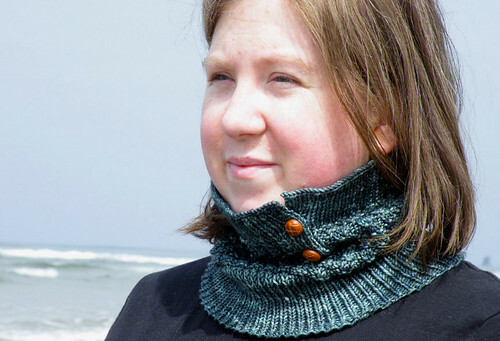 I think the other people on the beach were wondering why I was modeling knitwear. I absolutely love it. The color of the yarn is gorgeous. As always, I thoroughly enjoy looking at the pictures of your work. Great job. Wow very cool! I could not understand how this would look – I love it! The scarf is lovely and so practical. Like it better then a lot of other cowl patterns. I miss Cannon Beach so much. Being in SO Dakota and away from the ocean is horrible sometimes. I miss the sound of the waves a lot. Thank you for modeling this at my favorite spot on the coast.